The Hebridean Barns (located next to the Broch and campsite) are a unique resource. Hebridean ventilated barns of this type are to be found only in the Wester Ross parishes of Applecross, Gairloch and Loch Broom and are becoming increasingly rare. The barns date back to the 18th century or earlier and were used for winnowing and drying crops. The barns had fallen into a bad state of repair: the north barn roof was about to collapse and the south barn had no roof at all, just crumbling pillars. The project aimed at restoring the barns, using traditional methods and materials. First there needed to be a conservation plan produced and planning consents gained. Martin Wildgoose, archaeologist and traditional craftsman oversaw the project to ensure that the buildings were being treated sensitively and that the restoration was as close to the original as possible. Alistair McCowan, local engineer and member of the Applecross Historical Society, produced the conservation plan which detailed the history of the barns and plans for future restoration. The next phase of this project was about careful restoration. Martin oversaw the work of local craftspeople and both the north and south barns were lovingly put back together. There were deep silage pits dug into the floor of the north barn in the 20th century and great effort was made to also retain an element of these to ensure that visitors could understand the history of the building. Limestone and lime mortar was used for the rebuilding of the pillars, a tin roof was erected to both barns, and willow panels were individually created and placed between the pillars as they would have once done. The silage pits in the north barn were filled to a safe level but still visible, and one of the pits was left open with a barrier. A visitor information panel was produced and placed in the north barn and both buildings have since been used on a number of occasions, most notably for the end of ALPS party in July 2014. 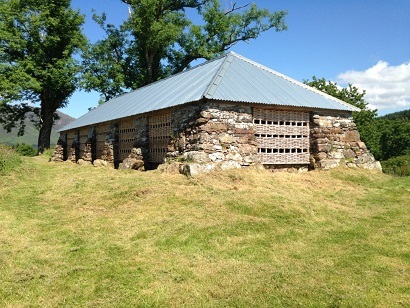 The barns form part of the Archaeological Trail and their history is detailed within the Archaeology booklet.